KEDkrafty: Haven't knat a stitch! I have to admit that I haven't knitted a stitch all week! 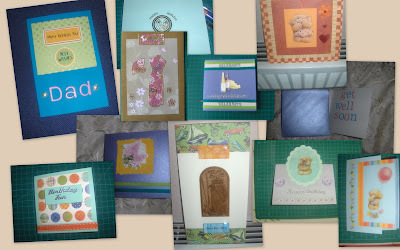 Have been doing some card crafting and some Facebooking though. Off to Hobbycrafts now because my "card stock" is all a bit pastel at the mo. Fancy some rainbow brights, and yes, some black. Thanks so much for your wonderful comments on my cards , you really make me blush !! I am far from an expert..... LOL , I just try to make something nice !! Your cards are looking great too ! We just have to have more time !! If we are making cards we can't knit and if we are knitting we can't make cards ! I allway scan my cards because i am really bad in making photo's !! With a scanner the cards are looking better , maybe you should do the same ?? Most important is - you are crafting! Looks like cards are turning into obsesion for you!